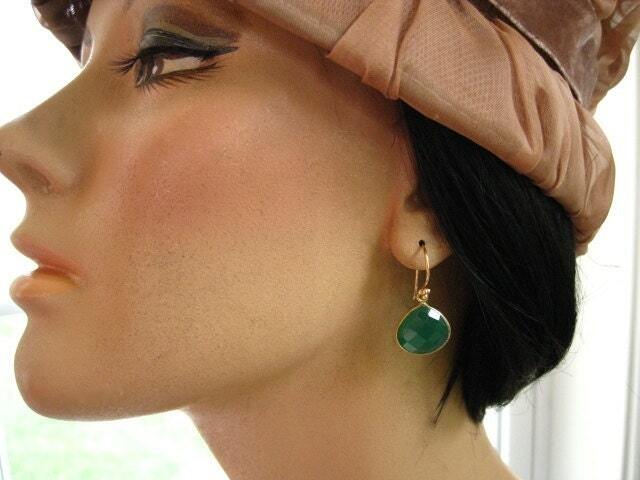 Large green onyx bezels (16mm) dangle simply and elegantly from 24kt *vermeil ear wires. 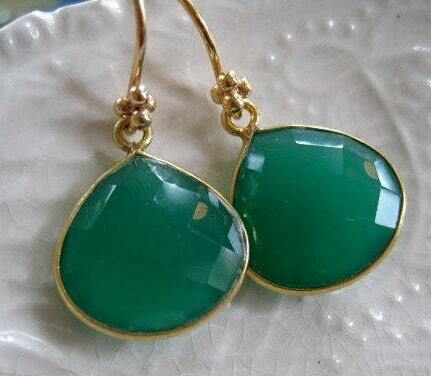 The green onyx are a lovely emerald green color, accented by the vermeil frame surrounding them. Lightweight and beautiful at 1 3/8" in length. Perfect everyday earrings and instant elegance! Your earrings will ship USPS first class mail with tracking and insurance in the US, and will be packaged in a lovely gift box tied with ribbon. **What is vermeil? Vermeil must meet the FTC standard of 100 millionths of an inch (2 ½ microns) of fine gold layered over sterling silver. In order for a piece to be labeled legally as "vermeil", the item must not be less than 10 karat gold and have a substantial thickness, with a minimum thickness of 2 ½ microns. A Vermeil piece of jewelry is made entirely of precious metals, which gives the piece an intrinsic value. *Is "vermeil" the same as "gold plate"? Absolutely not! In contrast to vermeil, which is a regulated layer of gold (a minimum of 2 ½ microns) over a precious metal…sterling silver, "gold plating" is a miniscule layer of solid gold applied to a brass base. The plating does not compose any measurable proportion of the product’s total weight, and is estimated to be 0.05% or less of the metal product. Gold plating will wear off rather quickly and expose the brass base product. *How to care for vermeil jewelry: While vermeil jewelry may tarnish (the base is sterling silver, a precious metal that tarnishes! ), it is easily cleaned and will remain beautiful, if cared for properly. For starters, I recommend storing your artisan jewelry in the box provided to you when you purchased your jewelry, or you can store it in an airtight bag, such as a Ziploc. This is a trick I learned years ago while being employed at a hand crafted jewelry boutique, where I got my start! Exposure to the elements (including humidity, pollution, dust, etc) will dull ALL jewelry, so keep your treasures looking beautiful by wiping gently with a dry, soft jeweler's cloth. Please, NO harsh chemicals, as it may not only damage the vermeil, but some gemstones, as well. In addition, perfume and hair spray should be applied PRIOR to putting on your jewelry (again, this goes for ALL jewelry, not just vermeil!). Finally, never, ever bathe or swim while wearing your jewelry. Vermeil and gold filled are beautiful and affordable alternative to solid gold, and will retain its beauty, if cared for properly. However, if solid gold is your preference, please contact me for a custom order and pricing!